Andy Street, the Mayor of West Midlands will be co-leading the first ever trade mission from Midlands to India in October this year, along with the Sir John Peace, Chair of Midlands Engine, Government Minister and SME businesses, This trip is aimed to further the business growth between UK and India and was announced at a conference and networking event titled ‘Accessing India Made Easier’ in the International Convention Centre (ICC) organised by the Consulate General of India in Birmingham on July 13th. 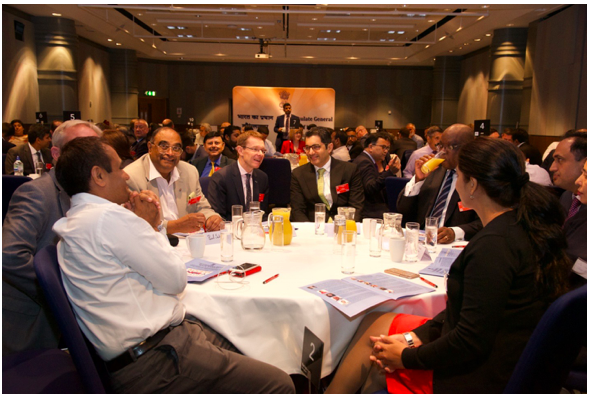 The event aimed to showcase and respond to queries regarding the flagship market entry support initiative ‘Access India Program’ (AIP) launched by the High Commission of India, London. The program intends to provide support to the Small and Medium Enterprises (SME) with innovative products and high-end technologies of the United Kingdom (UK) to access the ‘Make in India’ initiative of the Government of India and assist them to establish in India. The Consul General of India, Dr Aman Puri in his welcome address said that the Indian companies continue to repose their faith in the inherent strength of the British economy and were confident that Britain will be able overcome the roadblocks posed by Brexit, and to emerge stronger. He enumerated India’s strength as the fastest growing large economy of the world, scientific and technical manpower, and especially of the opportunities provided by India in alternatively fuelled vehicles and the health sector. Andy Street, Mayor of West Midlands said that both UK and India not only have a strong political and cultural relationship but also a very deep business relationship. He stated that there is uncertainty growing with Brexit but he hoped that UK will move forward from the present position and will lead the world during the fourth industrial revolution. Mr. Street added that the SME sector in the West Midlands was very vibrant and there has been a 50 percent growth in SMEs since 2010 and to support this growth West Midlands has received funds worth £250 million from Midlands Engine, and offer of credit to the tune of £370 million by Barclays. He also acknowledged that SME sector is undergoing digital revolution, and assured that the West Midlands is well placed for such changes. Dr. Shashi Baliyan shared the success story of how from one small opportunity he has created multiple opportunities during his venture in India. From being one of the leading oncology service providers in India, they diversified into running hospitals, hospital linen management including its manufacturing, supplying food for hospitals, and manpower training. He urged the companies to be innovative and capitalise on the opportunities provided by Indian market’s demand as the scale of economies is very high in India. Rishi Grover, Vice President informed that UTC Aerosystems, which is a US based global company, has several units in UK and two big manufacturing sites as well as some service and repair centres in Bangalore, India. Mr. Grover stated that the company was the first to receive an award in 2018 for ‘Make in India’ and was the first to send a Federal Aviation Administration (FAA) certified product out of India, which dispenses the need for separate quality certification. He added that the company was keen to develop a local ecosystem in India, and were able to take some of their global business partners to India to support the manufacturing. He told the UK SMEs that if they are ready to invest in India, then UTC Aerosystems can help them develop the ecosystem and that they potentially could become a very important supplier for UTC. The other speakers included were Baroness Sandip Verma (Chairperson of Lords European External Affairs Committee), Paul Uppal (Small Business Commissioner), Ian Harrison (Director of Exports, Midlands Region, Department of International Trade), Keith Stokes-Smith (President Greater Birmingham Commonwealth Chamber of Commerce), Param Shah (Director of Federation of Indian Chambers of Commerce, UK) and Saikat Sen Sharma, [Counsellor (Economic), High Commission of India, London]. Sir John Peace, Chairman of Midlands Engine, addressed the gathering via video message. Dr. Param Shah, Director of FICCI UK informed that to support SMEs, and to complement the efforts of DIT, a Portal ‘UKThat’ will be launched in September 2018. This will create a marketplace and enable the UK SMEs to sell to India, test Indian market and then enter the Indian market. The conference was well attended by representatives of trade associations, chambers of commerce, representatives of banks such as Santander, SBI, BOI, HDFC, PNB and around 60-70 owners of SMEs. In addition there were representatives from the Universitiy of Birmingham, Aston, Leeds, Bedford, Leicester, Lincoln & Nottingham Trent. The participants also interacted with a panel of experts formed by Dr Aman Puri, Ian Harrison, Sidharth Mukhne (Regional Head of UK India Business Council) Shashi Baliyan, Rishi Grover, Saikat Sen Sharma. The session focussed on sharing expertise, innovation, and discussions were held on exploring mutually beneficial collaboration with India.